This is my post on 12 days of interiors gifts ideas. If you can’t view the video please click here. As the snow falls outside my window, I can’t fail to feel Christmassy, but also a little smug! I have been ultra organised this year and so 95% of my presents are wrapped and under the tree. I appreciate that some of us may not be quite there, so I have a little helping hand for you. In the video are 12 possible interiors gifts for you to give your true love, as I don’t think you can go wrong when buying something for the home. The ones I have chosen are hopefully a little different, but also ideas I think you can feel fairly safe about giving – safer than buying a Christmas onesie anyway!!! You could give your true love a faux fur blanket. Let’s face it right now we all need one! These can cost a pretty penny, but I found a gorgeous and affordable one at Matalan. I think that one half of a couple is always more particular about using a coaster than the other! 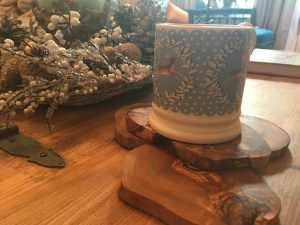 This theory makes a lovely set of coasters a great gift idea to save arguments! I love the olive wood ones I found in John Lewis. Because they are natural, each one is unique and will be quite versatile for many types of decor. 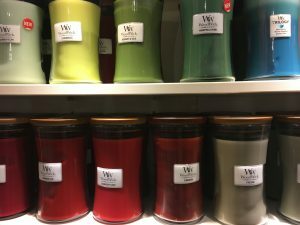 The way your house smells is really important to the whole ambiance. I love Lampe Berger products because they are safe as there isn’t a naked flame involved. They also kill bacteria in the air so can eliminate odours – good news after those brussel sprouts! 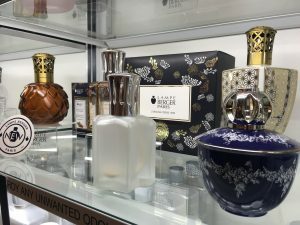 They have 50 scents to choose from, and look like exquisite ornaments. I bought mine from Vintage Attic in Sevenoaks, but you can find your local stockist online. Amazon Echo Dot is an amazing present if your loved one is into gadgets. Just be warned if you’re looking to lose weight in the new year you will miss the extra steps that Alexa saves you! This is one of my favourite ideas. How about an upcycling starter kit?! 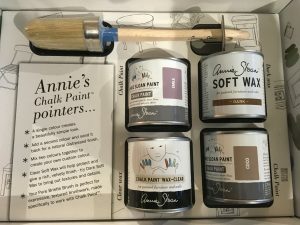 Annie Sloan does a great one which has everything you need to get going. I got mine from Dovetails Vintage in Sevenoaks, but you can check online for your local stockist. I love this branch candelabra from H&M. It could look really sophisticated in the right setting, but is very affordable. Believe it or not a small screwdriver set was one of the best home gifts I ever received! It’s so handy to keep in the kitchen draw for those quick jobs when you don’t want to get the big tool box out. It’s also a great hint for a loved one who never quite gets around to fixing this and that! What shows more thought than the gift of time? So how about offering to paint a room for your loved one, or just a feature wall? 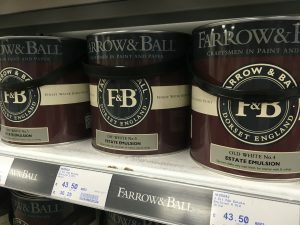 Go to somewhere like Brewers where you have a vast range of paints, loads of wallpaper samples, but also I’ve always found the staff in my local branch to be amazingly knowledgable and helpful. 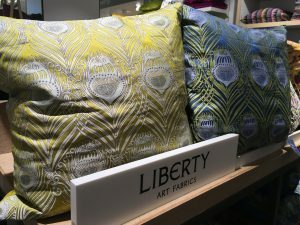 I love Liberty fabrics, but if you’re not in London you can get a gorgeous Liberty cushion from John Lewis now. To be honest, going to the real store at Christmas can be bedlam so this is welcome news. They are pretty pricey but worth every penny, in my opinion! My Fireside Woodwick candle is one of those gorgeous winter treats for me. It crackles like a real fire, and smells divine. You can’t help but feel romantic when one is lit, so what a gorgeous gift. I bought mine from Vintage Attic in Sevenoaks, but you can check online for your local stockist. So by now you’re desperate! The only time I could ever recommend a golden pineapple is if you’re desperate, but I’m sure there will be plenty left on the shelves even on Christmas Eve! Actually I still can’t recommend one of these!!! Of course the best gift you can give your true love on the big day is a kiss under the mistletoe! Although you try explaining to my toddler Bonnie why she got a kiss rather than a drum – which she has mentioned she wants every day since August!!!! If you’re still in decorating mode check out my favourite decorations. I wish you and Bonnie a Merry Christmas. The DIY and decorations wasn’t meant to be, being a TV personality isn’t easy. I now know what present to buy. You are a good person and beautiful. Thanks for all your support in 2017 Lamin and happy New year!